Soon after we made a decision to migrate, a realisation hit me while sitting in my yoga class. I am going to miss it! 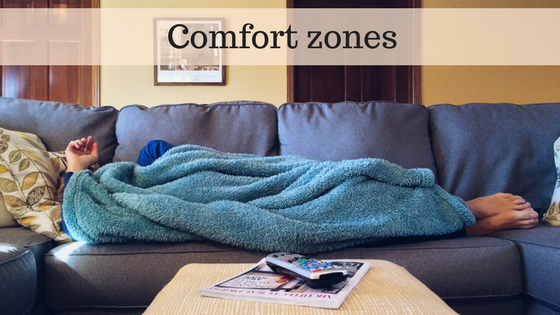 Comfort zones can be in any format. It can be your home, your car/bike, friends and family, your neighborhood, familiar places, food, weather, routine, workplace, colleagues, your boss (no matter how snobbish he or she is), your maid (I can see all those people who have lived abroad smiling and nodding 😉 ), the convenience of hailing an auto easily. We are so afraid of failing, of the unknown that we prefer to live in known miseries. Only if we could open ourselves to failing again. We weren’t afraid of failing as a child. Remember that time when you jumped over a wall without worrying about falling down or failing? As a child, we believe that we can do anything. Then the society gets in the way. It instils fear of failure, inclination towards safety. Would you be equally afraid of failure if no one was watching? That day, the prospect of missing the yoga class hit me hard in the forehead. I wasn’t so sure about the decision to move anymore. Just one thing, one favourite thing was enough to keep me grounded. But then it dawned on me. How we start noticing simple joys of life we tend to oversee conveniently. We notice all the negative things in everything and keep complaining about it. But the moment we think about leaving a place, a job or god forbid someone then suddenly we start noticing all the positive aspects of it. Only if we could notice them more often in our life while we still have those. Am I happy in the current life? Am I going to be happy in years to come if I continue in the same way? Am I achieving any of my dreams here? Is there a possibility of being happy and achieving my dreams in the new place? Am I willing to suffer to achieve my dreams or suffer for the sake of my comfort zones? How will I fly if I am too scared of leaving a tree branch? Ah! I understand how must have felt. When I first moved out of my house for work, it was difficult because I missed the things that I was comfortable with. Here it was all new and I had to manage it all on my own. But now that I think about it, I feel good to have made that choice. I hope moving out of your comfort zone made you realize that you had more opportunities than you had before.